Thanks so much to everyone who shared their thoughts on my post about using a nose aspirator on a baby.? It really helped me so much!? Jaden is doing much better today, though he still has a bad cough.? We are actually going to take him to the doctor in the morning to make sure all is well. 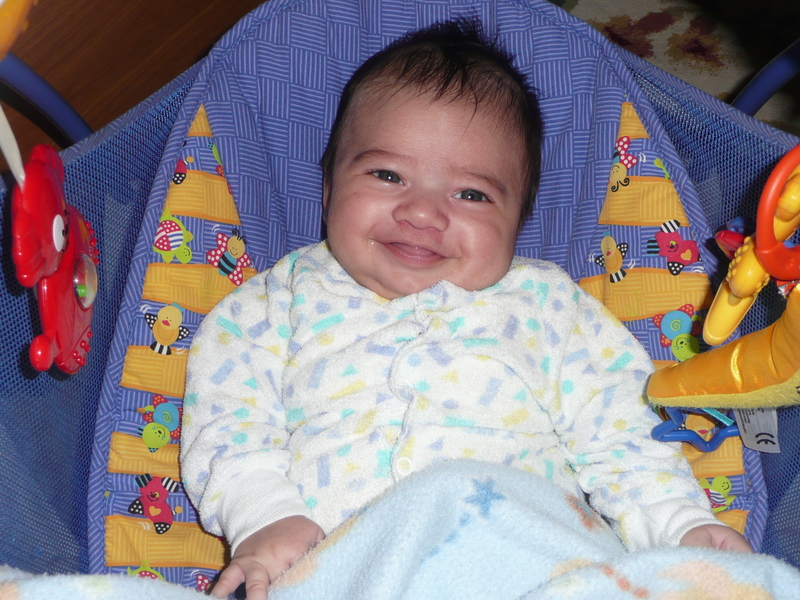 Anyway, I just wanted to share this picture that I took of the baby tonight in his swing.? The baby spends most of his time there. I bought this swing back in 2004 when I had my first child.? I am now using it with child #3 and it is holding up wonderfully.? It still looks brand new!? I think I bought it for around $60 back then. The seat has a soft removable cushion that is machine washable.? I have washed it quite a few times and the colors are still just as vibrant as when I bought it.? It has a music feature that you can turn on or can actually be activated by the baby’s movement.? I love the volume adjustment knob, because I often get tired of hearing the music while I am working, so I can turn it all the way down.? It also has lights that work with the music.?? Jaden get mesmerized by the 4 primary colored lights – it is cute. But my favorite part about the swing is that it is portable.? It has a handle on the top so you can transport the baby from room to room.?? It is probably not recommendable to do this while the baby is in the swing, but I actually do (don’t tell anyone – LOL) Another great portability feature, is that It folds up flat so you can just pop it in your car and take it with you wherever you go. ?I do this when we go to my mothers or visit friends. I did some research and found that my particular swing is no longer being sold, but there is an even better replacement called the Fisher-Price Aquarium Take-Along Swing.? It has even more features than mine does, so I am a bit jealous… but I am not going to go out and buy another one, because mine still works great! 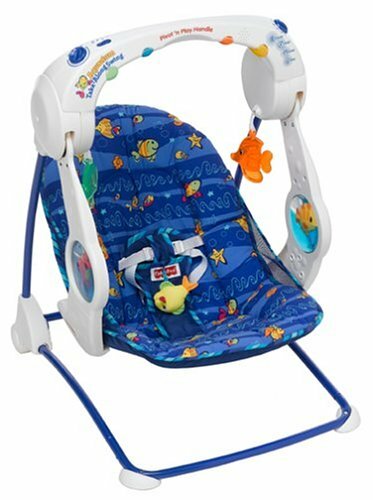 So, mama’s, if you or anyone you know is about to have a baby, make sure you purchase this wonderful baby swing – theFisher-Price Aquarium Take-Along Swing !! oh my godson jayce has one of those! it was a wonderful accomodation when he was tiny! lol now he just throws himself out of it! blah! That is the cutest baby I’ve seen in a long time. What a smile! We had the Fisher-Price Aquarium Take-Along Swing. when Lil Man was born and loved it. It had been given to us by a couple of my daughter’s friends whose baby hated being in a swing. Lil Man used it faithfully and it pretty much became ‘home’ to him. We hated to see him outgrow the swing and move on to bigger things but alas … it happens. Not long after Lil Man outgrew the swing we realized we were outgrowing our storage room with baby stuff that he had outgrown so we opened up and sold all of the little baby stuff without thinking into the future. Now that my oldest daughter is pregnant with her first baby we went swing shopping for this little guy. What we ended up with this time is the Fisher Price Rainforest Open Top Take-Along Swing. Fisher Price has never let us down and we believe we have made a good choice in the Rainforest collection.